Soft and spongy Rasgullas|Roshogolla|Rosogolla| Rasa gulla| Bengali rasgullas are a syrupy dessert with soft milk solid balls(chhena). It is North Indian dessert generally prepared during festival seasons like Diwali. Now adays this sweet is been popular among whole India and in almost all sweet shops have this sweet rasgullas. It looks a complicated recipe but is so simple than any other sweet recipes. Quick and easy to make handy dessert. The rasgullas are soft and spongy and flats on top of the syrup as it is light texture. Perfect for al festive seasons. I am making on behalf of Diwali. Do try this and let me know the outcome. Try to use wide vessel for making chhena| paneer as well as for making sugar syrup. for easy curdling and also when the chhena cooks in syrup it floats and it increases in size. You could use pressure cooker too. In a wide pan boil the milk. Once it comes to boil add the lemon juice and immediately switch off the gas and give a quick stir to mix. Wait for 2 minutes till the milk get curdled. Incase if it is partially curdled. It needs more lemon juice. So add more lemon juice when the milk is hot. Within 5 minutes the whey water separates from milk solids. Take a wide deep bowl and keep a muslin or white cotton cloth. Pour the whole mixture over the cloth and collect the milk solids on top. Now take the cloth and hang on the kitchen tap or keep on top of a strainer and keep a weight on top. Allow 15 -20 minutes to drain the whey water thoroughly. In a wide pan add 4 cups of water and sugar and allow to boil in a slow flame to make sugar syrup. Meanwhile open the cloth and keep the chena on top of a wide plate and knead to make a soft chhena with smooth texture. Using your palm mash the chhena well to get a soft texture. Once done add the powdered sugar and semolina and mix well till uniformly blend well. Now pinch a small marble sized piece from the chhena and roll with out any cracks on the surface. It makes around 12-15 balls from a litre of milk. 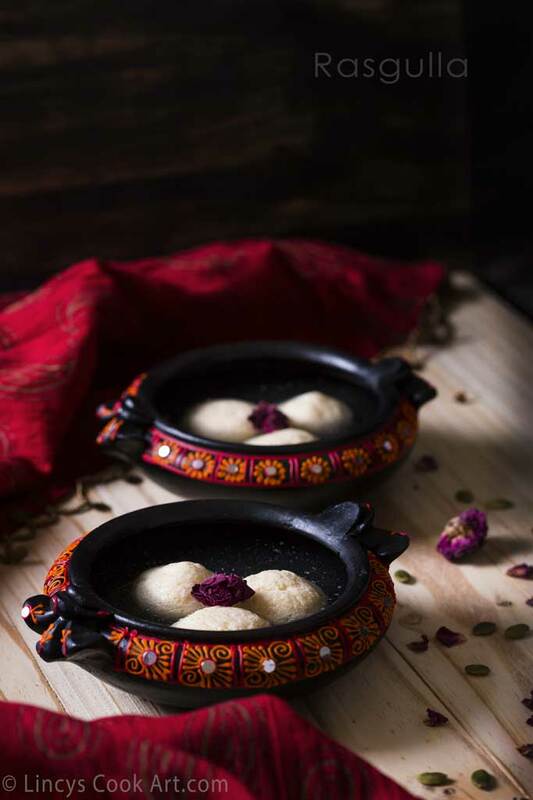 Allow the rasgulla to cool and once it is cool add the rose water and mix well. Refrigerate the rasgullas and serve chilled. Notes: Donot cook the milk after adding lemon juice. Cooking further will change the texture of the chana to dry. Use wide vessels for making rasgullas. You could use double cream milk or buffalo milk too for making rasgullas. Rasgulla looks delicious.. Lovely bowls..